China and India have a long way to go before their Soviet-origin aircraft carriers are a threat to each other, let alone the major powers. On February 19, 2010, the Indian Navy inducted an initial detachment of four carrier-borne MiG-29K fighters into its Black Panthers squadron. Only, it wasn’t an aircraft carrier they were taking off from. 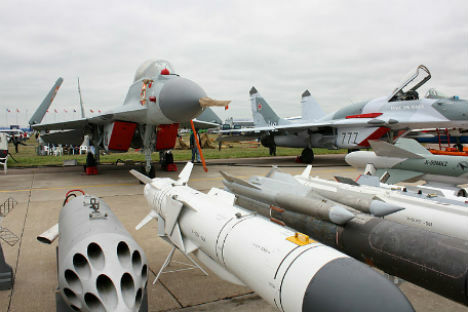 The Russian built interceptors, which have a range of over 3000 km, were instead based at the shore testing facility at Goa’s INS Hansa naval base. The formidable MiG-29Ks have become landlubbers as the Vikramaditya aircraft carrier, which was to be their home, is still months away from achieving seaworthiness. And with its lone carrier, the Viraat, spending more time in dry dock than at sea, the Indian Navy is effectively down to zero carrier capability. Considering that even Italy and Thailand operate aircraft carriers, the carrier vacuum in India must be rankling the Indian Navy’s brass. A little over a year later, the Chinese are going full steam ahead. On November 25, 2012, China landed a J-15 fighter jet on an aircraft carrier for the first time. The reason it took China so long to acquire an aircraft carrier was the Chinese Navy’s sea doctrine, which was – and continues to be – heavily influenced by the strategic thinking of its former patron, the Soviet Navy. The Soviets considered carriers extravagant – and large – targets for anti-ship missiles. According to this line of thinking, if a $1 million missile could sink a $1 billion aircraft carrier, then it was better to have a thousand such missiles instead of a vulnerable carrier. Even if 10 percent of these missiles found their target, the enemy’s carriers were dead in the water. The Chinese, therefore, went on to develop an armada of warships and swarms of missile boats armed with copies of Russia’s 3000-km range Kh-55 Granat missile. This nuclear-capable missile, which hugs the surface while travelling at Mach 2.8, thereby making it virtually undetectable, was illegally sold by Ukraine to Iran, which passed it on to China. But if carriers were bourgeois in the seventies, when China was poor, they are hard to resist now that the country has trillions in the bank. The opportunity came when a 30 percent finished Soviet aircraft carrier, the Varyag, was about to be cut up for scrap in Ukraine. Beijing set up an elaborate ruse. In 1998, China’s Chong Lot Travel Agency requested the Ukrainians to sell them the Varyag, claiming the ship would be used as a floating casino. The gamble worked – the Ukrainians demanded $20 million, the Chinese took the ship and bolted. It is a measure of China’s shipbuilding capabilities that they could transform the incomplete Varyag into the beautiful Liaoning in just 12 years. India is not in the same shipbuilding league as China. Its success in building a bluewater Navy depends entirely on the import of naval engineering and technologies and joint development with other countries, mainly Russia. Although India has built a number of frigates and destroyers, they are equipped with Russian weaponry. Again, for red hot technologies like nuclear-powered submarines, stealth warships and aircraft carriers, India has turned to Russia because none of these are available off the shelf. The Arihant class submarines, Vikrant class aircraft carriers, Delhi class destroyers, and the BrahMos supersonic cruise missile (including its hypersonic version) are among the potent platforms India is successfully implementing with Russian expertise. In combat India has achieved spectacular success with aircraft carriers. In the 1971 war, the Vikrant, supported by just two warships, bottled up the Pakistan Navy’s eastern wing in Chittagong harbour. Nearly 100,000 Pakistani troops were planning to escape on board these ships which were to make a dash for the open sea. The Vikrant’s vigil – and sinking of some Pakistani merchant vessels by its jets – ensured the largest capitulation of troops since General Paulus’ Sixth Army surrendered in Stalingrad in 1943. Deck aviation assets also helped India to quickly respond to the Indian Ocean tsunami in 2004 and provide humanitarian assistance and disaster relief to countries in South East Asia. Although it is a welcome development that Indians are now more China-focussed than in previous decades, the flip side is often there is an alarmist outlook. The Liaoning has raised some concerns in India about this impending Chinese “threat”. There was one hare-brained story in a business daily that the Chinese J-31 stealth fighters flying from aircraft carriers could outclass the Indian Navy’s MiG-29Ks. This was especially lame because the J-31 is an experimental aircraft that is a decade away from deployment whereas the 4++ generation MiG-29K is a combat hardened aircraft, which also has the unique ability to ferret out stealth aircraft. Thankfully, reality offers a welcome break from the bizarre world these correspondents live in. Reality check: On May 18, 1961, Lieutenant Radhakrishna Hariram Tahiliani (who later became admiral) landed India’s first jet on the deck of its first aircraft carrier, the Vikrant – that’s a lead of more than half a century over China. Despite the size of the Liaoning, China’s lack of technical experience with carrier operations suggests it will serve more as a training vessel then a ship for combat operations. Even the Global Times, China’s stridently nationalistic newspaper, quoted a Chinese military expert, who said the carrier “does not have the capacity to handle its tasks as it needs more adaptation to enhance its fighting capacity”. China does not have enough planes or pilots with the expertise to fully exploit its first carrier. Without experienced personnel, the Liaoning is likely to have limited military utility. Clearly, the “starter carrier” is designed to help the Chinese navy master tactics of naval airpower. And it's no walk in the park – perhaps the hardest act in the navy is landing a 22 tonne fighter laden with fuel and missiles, on a carrier rolling and pitching in choppy seas at night. Besides operating an air wing, the Chinese have to provide air, surface, and sub-surface defences for the Liaoning, supply the carrier, and train the personnel to operate it. Once the Liaoning clocks up some miles, the Chinese will surely send it steaming into the Pacific as a status symbol but until then it'll be years of landings, takeoffs and near misses. Western defence analysts have set a time frame of up to 25 years before the Chinese are able to launch a serious task force. However, Chinese ability is not to be underestimated. In fact, the speed with which they are able to field new weapons is startling. China cloned the J-15 fighter just eight years after obtaining an unlicensed version from Ukraine in 2004. There’s no reason why it cannot compress the time frame required to field a task force. Russian influence on Indian and Chinese navies can be measured by the fact that the vast majority of their ships are based on Russian or Soviet design. Currently, Indian and Chinese aircraft carriers rely on the Short Takeoff but Arrested Recovery (STOBAR) system for launching and recovering aircraft. STOBAR, which is deployed in all ex-Soviet carriers, is simpler to use but it cannot launch heavy aircraft. This places huge limitations on the payload carried by fighters, and also precludes the use of bulky airborne early warning (AEW) aircraft. Considering the vulnerability of carriers, the lack of AEW aircraft can reduce a carrier’s life from days to hours in the event of war. However, for its second indigenous 65,000 tonne carrier – tentatively named Vishal – the Indian Navy has declared it is going in for the more advanced Catapult-Assisted Takeoff but Arrested Recovery (CATOBAR) system. This is a huge move forward technologically. According to a US Naval War College report, catapults have to be extremely well designed and constructed to function effectively; in the words of one American specialist, “99 percent is a failing grade”.